The international community positively echoed a speech given by Chinese President Xi Jinping Thursday at the commemoration of the 70th anniversary of the victory of the Chinese People's War of Resistance Against Japanese Aggression and the World Anti-Fascist War. It was widely agreed that the event shows the Chinese people's determination to remember the history and safeguard peace together with the people worldwide. The international public opinion also pointed out that Xi's announcements in the speech that "China will never seek hegemony or expansion" and "China will cut the number of its troops by 300,000" further demonstrate that China is an important force in maintaining world peace and development. Ex-Mexican President Luis Echeverria said that Xi's speech fully conveys the Chinese people's love for world peace and their desire for maintaining world stability and prosperity. Indian strategic analyst and former Navy Commodore C. Uday Bhaskar said Xi's speech on Thursday during the spectacular parade in Beijing has sent an unambiguous message that China will not forget the brutalities by Japanese militarists during their aggression against China in the first half of last century. Bhaskar said that Xi's speech and the parade are a vehicle for China to demonstrate its military might and channel Chinese resolve to defend peace. 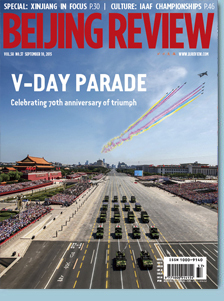 He pointed out that the parade also showed that China was not only a victorious party of the WWII, but also a modern military power on a global scale and a player in global geo-politics. "A total of 17 nations participated in this hugely symbolic parade that showcased many military platforms and high-tech weaponry that are of Chinese origin," he said. Describing the parade as spectacular and unforgettable, Bhaskar said Xi's speech is multi-layered and aimed at many audiences including those at Tian'anmen Square and beyond. Ramesh Chopra, a strategic analyst and former Indian Army Lieutenant general, said Xi's announcement to reduce Chinese armed forces personnel by 300,000 is a major driving action for the modernization of the Chinese military, which is also good for peace and stability of the region and the world. Ochieng Adala, acting executive director at the Africa Peace Forum (APFO) based in Kenya, said that China was the victim of aggression, therefore China had good reasons to celebrate the WWII victory. Peter Kagwanja, political scientist and CEO of Africa Policy Institute in Kenya, said that the parade is a fitting commemoration of China's victory against Fascist aggression during the WWII. The war-time killings in China exposed the brutality of Japanese fascism and global fascism at large, said Kagwanja. Levi Obonyo, director of the communication department of Daystar University in Kenya, said that China suffered immensely in the WWII and lost many citizens and its development was set back. Obonyo noted that it was China that engaged the Japanese first, adding China refused to surrender and it was truly remarkable that China fought with such limited equipment and still held the Japanese back. Metin Gurcan, a Turkish security analyst and scholar on changing character of warfare in Bilkent University in Ankara, said that, with this military parade, China gave a message that it did not forget the past. Deniz Ulke Aribogan, member of the Faculty of Political Sciences of the Istanbul University, said that China's WWII victory was not only an achievement over Japanese aggression, but also a victory of the whole world against fascism. Bo Zhiyue, director of New Zealand Contemporary China Research Center of Victoria University of Wellington, New Zealand, said that the decision to reduce the troops not only manifests China's determination to defend peace, but also offers a concrete measure to maintain regional and world peace. The commemoration activities are very important because they will help people review the past, remember the lesson of the war, and safeguard peace, said Bo. Qian Feng, vice president of Thailand's newspaper Asian Daily, said that Xi reiterated in his speech that China will never seek hegemony or expansion, and this reflects a traditional view in the Chinese culture and its firm resolve and confidence that China will take the path of peaceful development. Falk Hoehn, president of the University of Applied Sciences Stralsund,Germany, who was invited to witness the military parade on Thursday in Beijing, told Xinhua that he was impressed by the message of peace sent by Xi, especially his remarks "China will never seek hegemony or expansion. It will never inflict its past suffering on any other nation." "That is why I think the clear statement made by Xi that China poses no threat is very important," Hoehn said.